I got a NTK through the post today. Attached is the NTK and sat view of the layout. The entrance ANPR camera is before any car park signs, It does not say whether the driver was parked in the actual car park or on the forecourt. You say the invoice arrived today which Is the 11th October so the letter did not arrive within the correct time. You partly obscured the arrival times and we do not yet know the actual length of time allowed. Were you well over the a!lowed time or Just a matter of minutes? My first instinct would be to call Sainsbury's And explain why you overstayed (assuming You did)tell them how much you spent with them And the reason for the time spent and ask That as you are a regular and good customer Could they kindly cancel the ticket for you Especially as you received the ticket out of time Thus breaching the Data Protection Act. Apologies, I opened the letter today, but it came yesterday on 10th. Max time on the signage is 60 minutes (No return within 2 hours). I obscured the exact times as I wasn't sure how anonymous to make it. Total time was 3 hours 20 minutes. Driver shopped for lunch in Sainsbury's but also visited the local area. They don't think they have the receipt but apparently may still be in my car. Just to add, there are garages after the ANPR which appear to be public. I am unsure where the driver actually parked, but if they had parked in that area, then surely this is invalid? Do you know whose sign it is? Some of the parking cos make up artificial time limits. Sorry not sure I understand what you're asking. I'm guessing Euro Car Parks owns the signs. They say "Working in partnership with Sainsbury's". I have emailed Sainsbury's to find out who owns the land infront of the garages, as the driver may have parked here. Can you get down there and photograph the entrance from the public highway and then the sigange as you see it as you go in plus a close up of the sign and any that are different so they can be read easily. say approximately how big they are, how far off the ground and how bif the font size is. Now, if there is a good reason your car was there for a long time you should get on to Sainsburys HQ and moan at them to cancel it. Drinking gallons of coffee in their cafeteria would suffice but if you just parked there to go on a jolly in central London i wouldnt even start that conversation unless you cna prove you did some shopping atthere at the time. So, show us the siganeg and we can help you from there. Plenty of hurdles for them to jump yet before their charge is lawful. I'll get some pictures when I can get there, it's only 16 miles away but is in London so would take me more than an hour. The signage is the same as what is on streetview if that helps? The images were taken recently. 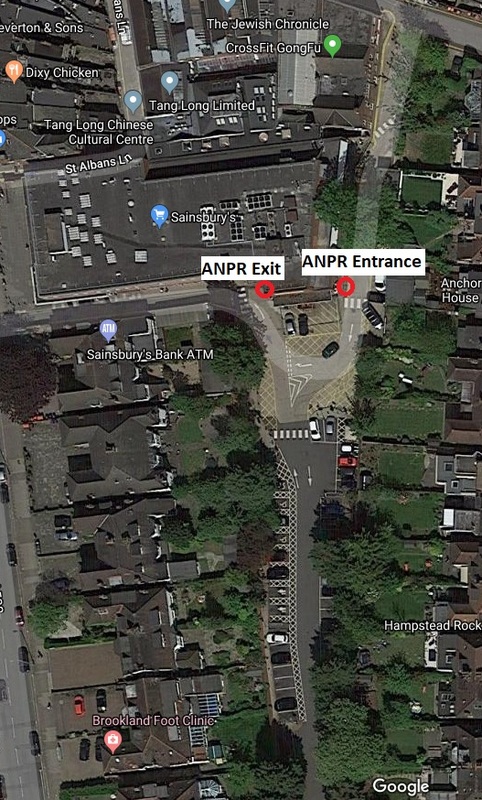 The public highway is a one way system where you can't avoid going through their ANPR, and it isn't obvious that it is a car park, no signs until after ANPR. There is what I believe to be public land after the ANPR in 2 places and cars often park there instead. I have emailed Sainsburys HO to confirm who the land belongs to. The driver did some shopping in Sainsburys at the time. Now there are a couple of Sauinsburys where this is a known problem, the one in Beddington, Croydon is a classic with a bus route going through the car park and a public access road to other buildings at one side that also gets snapped. there is another one where there is access to soem houses and agian PE send out demands and moan that they werent told you had visitors and it isnt fair that they have to cancel a ticket just because you have friends. thre are 2 Sainsburys in that area so which one is the subject? They ahvent specified so get pictures of the other one as well so you can use them as a big stick if it goes that far. Now for ANPR capture they MUST provide photographic evidence in the NTK and I cant see anything on yours that fulfils this requirement. It is not just about number plates it is evidence of the vehicle and thei toy cameras are around 5% wrong so they need to show more than a digitally altered picture of a small part fo a vehicle. Again, that is somehting to clobber them with but they wont be willing to accept this argument as they would have to do some work then and probably lose money. So, if you can nice pictures of the entrance from the public highway, evidence the camera is spying on the wrong place and pictures of the other sainsburys just down the road to cause confusion and show they have breached the POFA in their lazy NTK. They did specify which Salisbury's in the letter. Further down they gave the full address. It's going to be difficult getting there to take pictures of the signs, it's around a 3 hour round trip, or 2 hours at night. How important is it to get those pictures? Could you tell us which Sainsbury's and which address please, Joey? Thank you, I've amended your thread title. Still unsure if I will be able to get there to take pictures. My car isn't doing so well and has MOT due very soon. I've contacted Sainsburys to see if they can do anything. aqnd how have you contacted sainsburys? if by email it means you ahvent read a lot of the threads that say dont use email because all that happens is they forward the email to the parking co who then just use it to harass you. Phoning head office would have been the first step and then a stiff letter to the corporate team at the top rather than any customer service group. Email to head office without giving any exact details. I'll see what they say. I'm not so good on the phone and get a bit anxious. If this doesn't go anywhere then I'll do the letter. what email addy did you sned it to, we always say look up the boss's email address at ceoemail and use that. It will get through to a hO team and they have the clout to order ECP to stop being silly. If you have emailed a customerservices addy you ahve just given away more information to the parking co.
Yep customer service. But I didn't give details yet. I wanted to see what they say before giving any details or dates. Passing any details will be against GDPR anyway since I didn't ask them to get ECP to cancel, just asking if they would be willing to. I've sent a follow up email demanding that my details are not passed to ECP unless I agree so. I'll email Mike Coupe, is there anything in particular I should say? Should it be an email on mitigating circumstances or complain about the parking company themselves and that the driver parked on public land just after the ANPR camera? Thanks ericsbrother, I'll get an email written up today. Do you think it would be worth me asking who owns the garages next to the car park as the driver may have parked here and I can use this as a defence? If a car were to reverse in front of the last garage, it would have been caught on ANPR. Does ANPR record video? as this may show this. I have an over stay from Euro Car Parks from staying too long at a Sainbury's. I emailed their customer service (waste of time), but made it clear I didn't want any of my details passed on to ECP unless it is to instruct ECP to cancel the notice. This way they can't pass on details which would show you as the driver. I looked at the Bolton Store on Street view and I can see the entrance ANPR, but I cannot see the exit, since the car park slowly turns into another car park managed by another company and there are many ways to exit the ECP operated carpark. After complaining to the Customer Service team, I got an email from the Head Office who want more details. I emailed back mentioning about the tax they are putting on their customers and some other points. I will update again once I have a reply from them. I've also read the BPA Code of Practice, and realised that where they put the sign for the car park entrance is beyond the ANPR. the ANPR doesn't even cover if cars are entering the actual car park or not. There is no way that they can prove if any cars captured on ANPR even entered the car park. There is a a separate sign just before the ANPR that only covers parking in the service area. I couldn't find this mentioned in the CoP, but is it worth complaining to the BPA about anyway? You get the ticket sorted with Sainsburys befoe you start anything else. Also consider who is trhe BPA paymaster, it is again sainsburys who should receive the complaint first so once your ticket is cancelled you can go on the attack. Joey, we still need more detail about the location of the store i your thread.